The strategic Jammu-Srinagar National Highway was closed for the second successive day today as intermittent rains briefly hampered road clearance operations, officials said. A massive landslide blocked the 270-km highway, the only all-weather road linking Kashmir with rest of the country, at Ramsoo in Ramban district early yesterday, leaving hundreds of vehicles stranded. 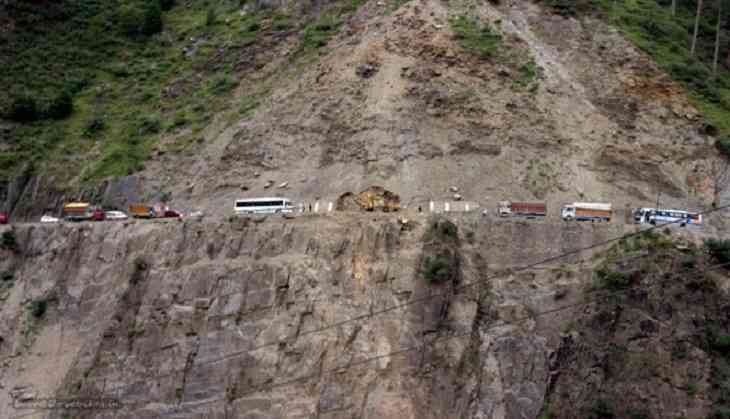 "The road clearance operation is in full swing and got briefly hampered due to intermittent rains...explosives were used to blast the huge rocks which have rolled down on the highway, the officials said. They said efforts are on to make the highway traffic worthy in the shortest possible time. "No vehicle was allowed to move from either Jammu or Srinagar on the highway for the second day today," the officials said adding preference will be given to stranded vehicles once the arterial road is opened for traffic. They said over 900 vehicles including those carrying passengers got stranded on the highway after the closure of the road yesterday. Many vehicles returned to the places of their origin but those which remained stranded at different places along the highway have been moved to safer places and their passengers accommodated in shelter sheds and provided meals, the officials said. They said senior civil and police officers including district development commissioner are personally monitored the road clearance operation and ensured that all stranded passengers are provided meals besides night shelter at designated places. The officials requested commuters to contact traffic control rooms before starting their journey on the highway.